What did the eclipse look like along the path of totality? What did the recent eclipse citizen science project learn about the sun's corona? 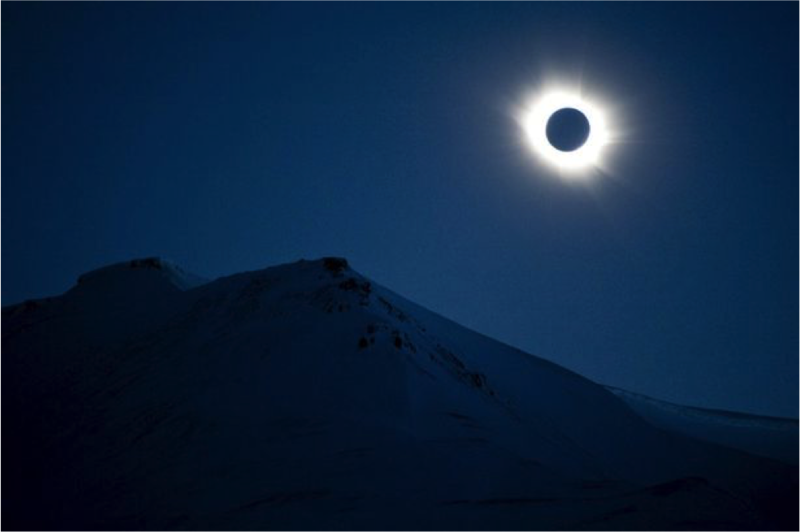 This special planetarium program features a slideshow of photos and videos of the August 21 total solar eclipse along with stories from local astronomers Galen Gisler, Rick Wallace, and Paul Arendt, who watched the eclipse from within the path of totality. Galen Gisler will also reveal results from the Citizen Continental-America Telescopic Eclipse (CATE) Experiment that gathered data from 60 sites along the path of totality in order to assemble a 90-minute record of the sun's inner corona. PEEC volunteers and students from the Los Alamos High School helped with the experiment from their vantage point in central Wyoming. Gisler will share their experience and what this study revealed about the dynamics of the sun's inner corona. Because we only have 50 seats in the planetarium, we ask that you please purchase your tickets in advance. Tickets may be purchased by visiting or calling the Los Alamos Nature Center at (505) 662-0460. Admission: $6/adult, $4/child. Planetarium shows are not recommended for kids under age 4. Galen Gisler was born under the dark and starry skies of eastern New Mexico and he eventually found his way back to his home state. With a Bachelor’s degree in physics and astronomy from Yale University, and a Ph.D. in astrophysics from the University of Cambridge (England), Galen went on to postdoctoral positions at the Leiden University Observatory (Netherlands) and Kitt Peak National Observatory (Arizona). He spent two years at the National Radio Astronomy Observatory in Charlottesville, Virginia, where he met his wife Susan. In 1981 he began a 25-year career at the Los Alamos National Laboratory. Galen has been involved in a variety of activities including extragalactic jets, particle beams, plasmas, astronomical transients, adaptive processing, and hydrocode simulations of impact processes and tsunamis. In 2006 he and Susan moved to Norway where Galen held a senior research position at the Center for the Physics of Geological Processes at the University of Oslo. They returned to Los Alamos late in 2012 to enjoy the mountains. Although semi-retired, Galen works as an Associate at LANL on ways of defending the Earth against asteroid impacts. Galen and Susan have two children, Andy who lives in Boulder and works as an aerospace engineer, and Ellie who lives in New Jersey and works in music arts management. Rick Wallace has a Ph.D. in Astronomy & Astrophysics from U.C. Santa Cruz (Lick Observatory), with concentration in numerical calculations of stellar explosions (Novae, Supernovae, Gamma Ray Bursts), and nuclear fusion. He has worked as a staff member at Los Alamos National Laboratory for 30 years, working on physics simulations, security of Russian nuclear material after the fall of the USSR, technical management, and international safeguards (including 3 years at the IAEA in Vienna, Austria, looking for States that might not be complying with their arms control treaty agreements). His hobbies include nature photography and Astronomy education. Paul Arendt’s early working career included research on nuclear fuel enrichment processes for commercial manufacturing. Arendt’s time at LANL primarily focused on the development of thin film nano-materials for superconducting, semiconducting, and optical applications. He spent his latter career years developing high-strength carbon-nanotube composite materials. His association at PEEC began several years ago when he served on its Board of Directors and led group hikes in the surrounding area. At the time, PEEC was still located at its old Orange Street facility. When the opportunity arose to work with the county and help design a new Los Alamos Nature Center building, Paul was excited to contribute to the layout and infrastructure requirements of the building’s planetarium. Now he is privileged to serve as a one of its volunteer presenter’s for our amazing New Mexico night skies.